As I read this verse the other day, I wondered why it was written “He will be found by you”, rather than “you will find Him”. I began to think about my children and how they love to play hide and seek. Of course, I could hide myself so they would never find me. Their knowledge is limited and they can not think of all the wonderful hiding places that exist in our home. 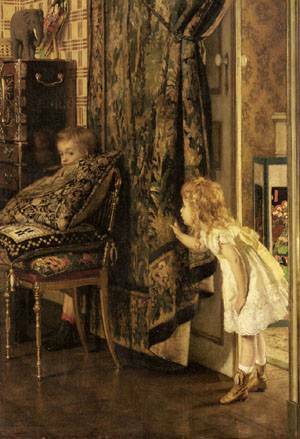 So, because I don’t want it to be a frustration for them, I hide myself in an easily visible place–kind of like the little boy in this painting. Oh, the joy, the rapture when they discover me. “Ah, you found me!” I pretend to be amazed. They jump up and down and, of course, want to play again. This reverie continued on to recognise that God, our father, is omniscient. He knows every great hiding place in the whole universe and beyond–He could hide himself from us so that we would never find Him. But, he doesn’t want to frustrate us. He loves us. He wants us to find Him. So, He doesn’t make it difficult. If we seek Him, He will be found! 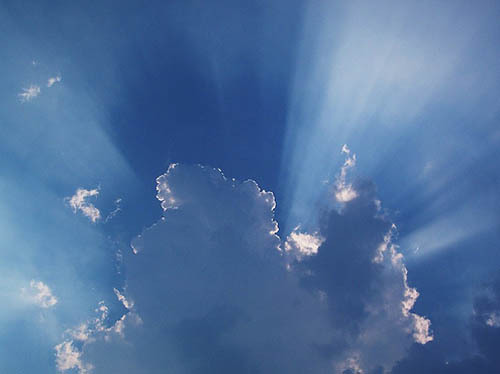 I kind of like to imagine, when I see the clouds with rays bursting from behind them, that this is maybe how God hides. While you can’t see Him directly, you can see His glory shining all around. A dead give away, if you ask me. Beautiful post! “If we seek Him”…. wonderful words you have been pondering. I love to consider God’s ways with His children. It helps me pray effectively when I better understand His character. Thanks for this encouragement. It reminds me that in times when God seems distant, when we feel we can’t see Him, it’s becuase our eyes are closed. All we have to do is open our eyes and turn toward Him and He will do the rest to make sure He is found. It makes me realise its not about the effort we put into seeking Him, but about our attitude of seeking: trust. While reading your post I also wondered ‘if God wants us to find Him, why does He hide?’. Perhaps when seeking something your object becomes better known and cherished through the journey. Thanks for your posts they have been a blessing.